Cetacea includes biggest animals which have ever lived – the blue whale is a cetacean, so are the intelligent and friendly dolphins and porpoises. Porpoises are small cetaceans. Cetaceans are marine mammals. They are made to live in the sea. They have streamlined bodies which help them to swim swiftly. Their forelimbs act like flippers. Their back limbs are extremely small. Their tails lie flat, instead of vertically like a fish tail. Cetaceans are well insulated by a thick layer of fat which keeps them warm in the cool seawater. They breathe air into their lungs. 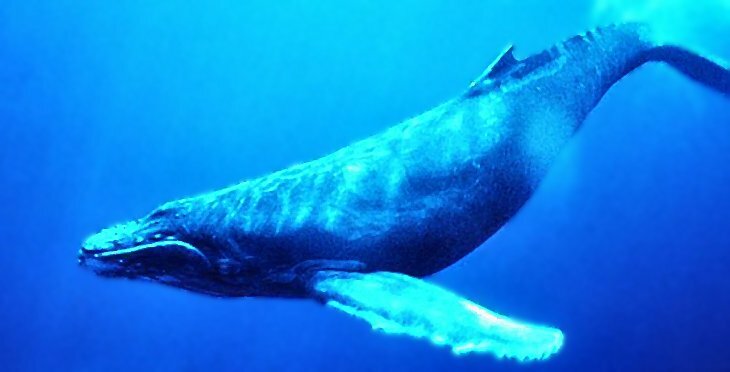 When they dive into the deep blue sea, their blowholes (which are their nostrils, on top of their head) will be closed. It will only open when the cetaceans surface again. They will breathe out explosively through their blowholes. This will cause a bushy stream of misty air and vapor. Warm air will be exhaled from the blowholes. After exhaling they will immediately inhale fresh air and the blowholes will close again. The blowholes are in stay closed when the cetaceans relaxes, so they can relax underwater. It takes only a fraction of a second for small cetaceans like dolphins and porpoises to breathe, but it may take a few seconds longer for larger cetaceans like the blue whale. The blowholes are located on the top of their head. The blowholes are covered by muscular flaps that keep water from entering in when the cetaceans are underwater. They cannot breathe through their mouth. They can only breathe through their blowholes. downward. The tear glands in their eyes secrete greasy tears which protect their eyes from the salty seawater. Their lenses are almost spherical in shape. These lenses are able to focus the tiny amount of light in the deep water. They have small ears – just a tiny hole in the skin. They do not have external ears to hear. Anyway, the external ears are unnecessary because water conducts sound better than air. They have a highly developed inner ear to detect sounds from far away. They are also able to tell were the sound came from. They are like humans too. They use sound to communicate. They groan, moan, whistle and click. 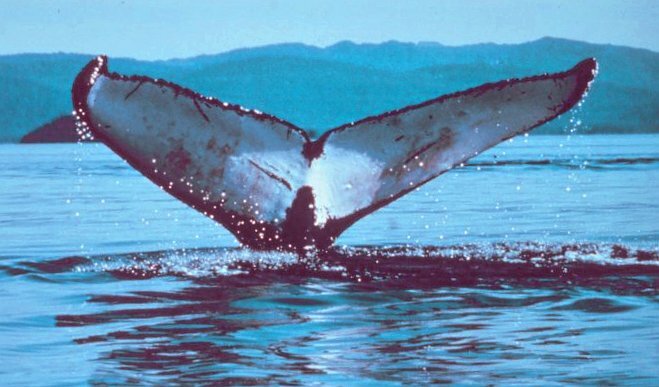 Believe it or not, the humpback whale can even sing! There are two main groups of cetaceans. The toothed whales, called Odontoceti, include the sperm whales, belugas, dolphins and porpoises. They have teeth which they use to catch fish, squid and other marine creatures for food. They do not chew their food but swallow it whole. When they catch large prey, like a the seal, they will bite off and swallow one chunk at a time. They have only one blowhole. The group called Mysticeti don’t have teeth as adults. Instead they have baleen plates which look like fringes hanging from the upper jaw. These baleen plates separate small animals like krill and fish from large mouthfuls of seawater. They have 2 blowholes, located side by side. Examples of mysticeti cetaceans are the Blue Whale, the Humpback, Bowhead and Minke Whales. Cetaceans are mammals. Since they are mammals, they are warm-blooded, they breathe air through their lungs, they give milk to their babies and finally they even have hair, although they are almost hairless. God’s name be praised! He created this great creature!